TonerGreen.com Complaints - How Can We Help You | TonerGreen - Eco-Friendly Toners from the U.S.
TonerGreen.com, is an eco-friendly e-commerce shop known for providing customers and go-green supporters with environmentally responsibile printing solutions. For three years, TonerGreen has been supplying a variety of value-added environment-friendly products. Our primary product line includes U.S. made premium remanufactured toner cartridges and remanufactured inkjet cartridges for major printer brands like HP, Brother, Dell, Epson, Lexmark and Xerox to name a few. TonerGreen has been envisioned to be a leading source of specialty products that contribute to energy conservation, sustainability and environmental responsibility. To reach its goal, TonerGreen stick to its three core values: (1) Value-added products and services - TonerGreen intends to help you make eco-friendly choices for your home or office, (2) Relentless commitment to quality - TonerGreen prioritize quality and customer satisfaction over low-cost and cutbacks, and (3) Social responsibility - TonerGreen gives back to the planet by supporting non-profit organizations like EarthShare that are dedicated to eco-friendly causes. 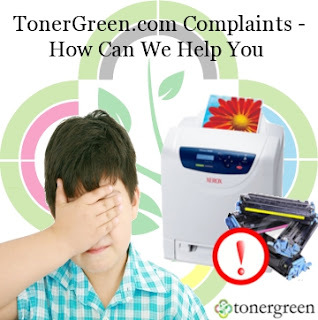 Moreover, we, at Tonergreen, are always looking for the best way to serve our customers, believing that your feedback is the most important information we can use to improve our store to serve you better. And we don't just simply gloat on the good reviews we're receiving, we prioritize problems and complaints that our customers report to so we can take action to resolve them as soon as possible. "I've ordered my printer cartridges but they have not arrived yet. What am I supposed to do?" TonerGreen: Such thing is rare to happen but if you encountered this situation, you can contact our agents to update the shipping process of your orders and will provide you with the tracking number. "I want to save more money on my cartridges. How can I use the coupons TonerGreen gives to its customers?" TonerGreen: TonerGreen coupons can be found at the TonerGreen site. This coupons allow you to save more money by giving you discounts. You can use this by keying in the coupon code on a designated box at the checkout page. For more information, you can check this article here titled "Use TonerGreen Coupons to Save Even More." "Remanufactured toner cartridges are recycled ones, there's no reassurance that they will work well." TonerGreen: Recycling is just a small part of the extensive remanufacturing process that our product undergoes. Quality is strictly imposed every step of the remanufacturing process until our products are either picked up by customers or shipped to their address. "The cartridges I have ordered are not working." TonerGreen: If ever such situations happen to you, be reminded that all of TonerGreen products are backed with 2 year warranty. You can report defective cartridges to us and we'll ship a replacement to you as soon as possible for your convenience. For questions and complaints about our products, you can easily contact us here or call us via phone (888) 714-8219. Our office hours are from Monday to Friday 8am to 5pm PST. We'll gladly prioritize your questions and problems because at TonerGreen, we value your convenience and satisfaction.